On the primary host (Pistacia), Smynthurodes betae fundatrices induce small red midrib galls, and their offspring induce yellow-green or red spindle-shaped leaf margin galls. On the secondary host (roots of many plants) adult apterae are small to medium-sized, globular in shape, and coloured a dirty yellowish white (see first picture below). They are wax dusted, and clothed with numerous fine hairs. Their immatures are light green (see second picture below). The head, prothorax, antennae and legs are light brown. The antenna are 5-segmented (cf. Trama species which have six antennal segments) and the second antennal segment is elongated and about the same thickness as the third antennal segment. 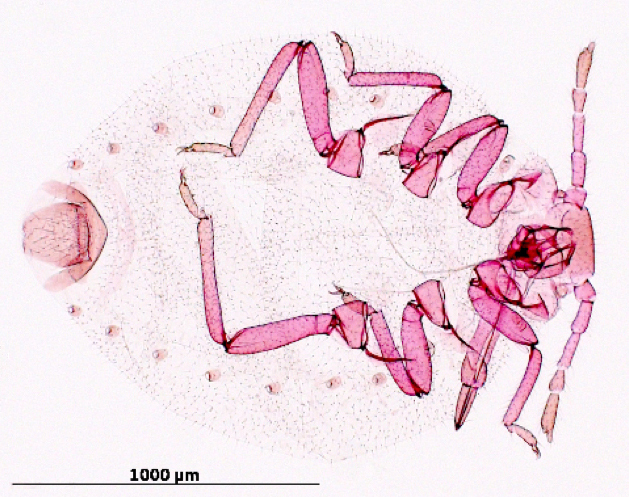 There are thick sclerotized rims on the primary rhinaria of the last two antennal segments. There are no siphunculi (cf. Protrama, Tetraneura and Anoecia species, which have siphunculi). The body length of the adult Smynthurodes betae aptera is 1.6-2.7 mm. Alates of Smynthurodes betae (see second picture below) have dark transverse bars on the abdominal tergites. Clarified mounted aptera and alate courtesy Favret, C. & G.L. Miller, AphID. Identification Technology Program, CPHST, PPQ, APHIS, USDA; Fort Collins, CO.
Where the primary host (Pistacia) is found, the bean root aphid goes through its full life cycle, host alternating from Pistacia to numerous secondary hosts, especially in the Asteraceae (Artemisia, Arctium), Fabaceae (Phaseolus, Vicia, Trifolium), and Solanaceae (Solanum tuberosum, Lycopersicon esculentum) - and sometimes on Beta, Brassica, Capsella, Gossypium, Heliotropum, Rumex, and others. Smynthurodes betae can persist on its secondary hosts as anholocyclic parthenogenetic populations. 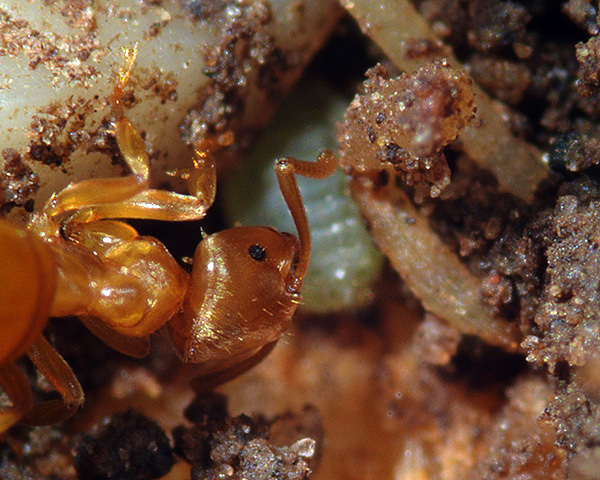 It commonly overwinters in ant's nests. Anholocyclic parthenogenetic populations of Smynthurodes betae are found in most countries of the world, except the coldest parts. This polyphagous aphid goes through its full life cycle in North Africa, Israel, Syria, Iran, southern Crimea, Transcaucasus and Pakistan. The primary host of Smynthurodes betae is largely the Mt Atlas mastic tree (Pistacia atlantica). The fundatrix, which develops from the egg, forms a small 5-7 mm long red gall on the midrib of the leaflet. The apterous second generation nymphs disperse from the fundatrix gall and induce the final, spindle-shaped galls about 20 mm long on the leaflet margin. Each final gall is formed by a single F2 (second generation) aphid. In most Pemphigidae only the fundatrix forms the gall. The entire life cycle of Smynthurodes betae on Pistacia atlantica can still be completed in some fundatrix galls. While the fundatrix galls of the five different species of Fordini are morphologically similar, the final galls are very different in structure and morphology. There appears to be no advantage to the two-gall system in terms of total reproductive output since the two-gall root aphid Smynthurodes betae and the one-gall root aphid Aploneura lentisci produce similar numbers of offspring expressed per fundatrix. Instead the main advantage of the two-gall system was thought to be that clone subdivision spreads the risk of clone destruction by environmental factors or by natural enemies. Inbar (1998) investigated competition, territoriality and maternal defense in Smynthurodes betae. Videotaped behavior and experiments demonstrated that first instar offspring of the fundatrix protect their galling sites against competitors of their own species (the larger individuals win), as well as against first instar competitors of the sympatric galling aphid Forda riccobonii. In mature galls, adult aphids also protect their gall and their offspring from conspecific invaders and natural enemies. The fighting behavior of the adult aphid is unique: the aphid seizes the intruder while lying on its back, enabling use of all six legs and the mouthparts. 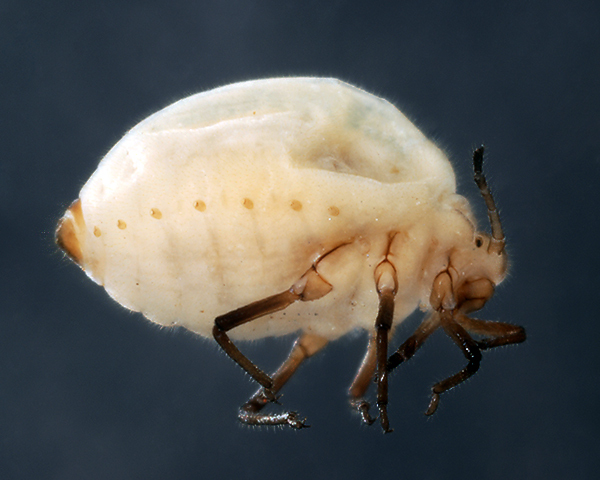 Although the aggressive behavior of the adult aphid protects the gall and offspring, no distinct parental care behavior was observed. The territoriality and aggression are highly adaptive because of the limited number of galling sites. Under natural conditions, removal of the adult aphids from the galls resulted in significantly increased invasion by conspecific intruders. The results indicated that the role of interspecific competition and natural enemies in shaping adult behavior is rather limited. The open galls and the unique life-cycle of Smynthurodes betae encourage and prolong intraspecific competition and facilitate confrontations between adults and invading nymphs. 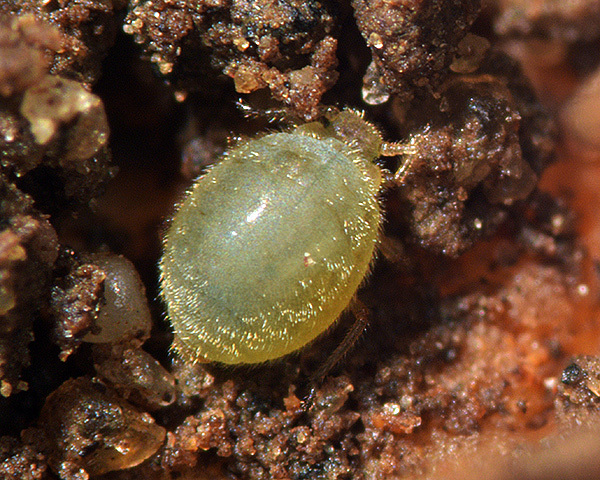 The ability of the adult owner of a gall to prevent invasions of nymphs has promoted the evolution of maternal defense in this aphid. This study supported the hypothesis that galls, as high value resources that combine food and shelter, are often associated with defensive and social behavior. Wool & Burstein (1991) reported on parasitoids of Smynthurodes betae in Israel. They found that more than 20% of the fundatrix galls were parasitized by Monoctonia pistaciaecola. This was a new host record for this parasitoid. A pteromalid hyper-parasite was identified as Pachyneuron? leucopiscida. It was noted that rather few parasitoids are known from gall-forming aphids, compared with free-living ones. As is common for root aphids, rather less work has been done on Smynthurodes betae on their secondary host - such as the roots of beans, parsnips, potatoes, tomatoes, cabbages, and Euphorbia species - than on the primary host, despite the fact that Smynthurodes betae is more of a pest on the secondary than on the primary host. The picture below shows two white adult Smynthurodes betae (bean root aphid) on parsnip, one of them being transported in the jaws of a yellow meadow ant (Lasius flavus). Image above by permission, copyright Maria Fremlin, all rights reserved. 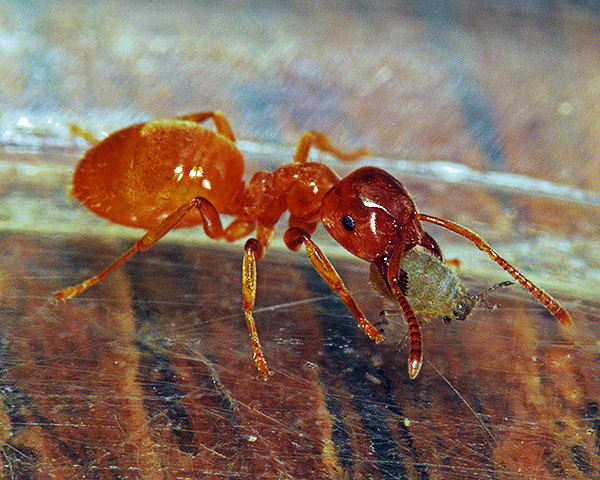 On its secondary host Smynthurodes betae is invariably attended by ants, and has been described as being entirely dependent on ants. The aphids we observed were very closely attended by Lasius flavus. 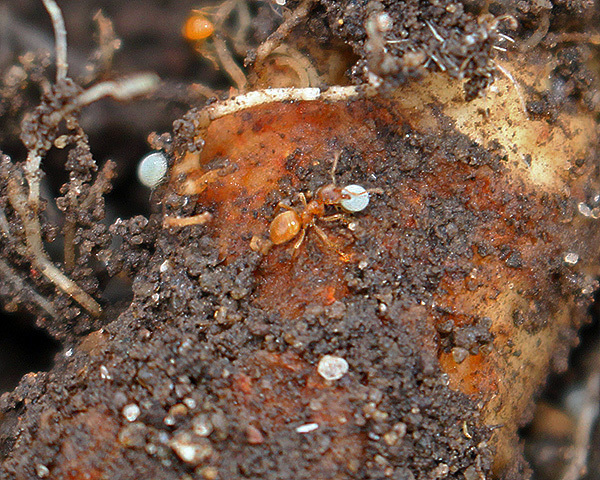 These ants would frequently pick up the aphids in their jaws (see picture below) and reposition them at less exposed places on the parsnip root. Landis (1967) noted that most root aphids are more or less dependent upon a few species of ants for survival. He studied the attendance of Smynthurodes betae by a thief ant (Solenopsis molesta) and the pavement ant (Tetramorium caespitum). Blackman & Eastop list Smynthurodes betae on 4 Pistacia species: Pistacia atlantica (a pistachio tree species, Mount Atlas mastic tree, Persian turpentine tree), Pistacia mutica (wild pistachio tree), Pistacia terebinthus (turpentine tree, terebinth) and Pistacia vera (commercially-grown edible pistachio). Blackman & Eastop list 13 species of aphid as feeding on Mount Atlas mastic tree (Pistacia atlantica) worldwide, and provide formal identification keys. Of those aphid species, Baker (2015) lists 3 as occurring in Britain: Forda formicaria, Forda marginata and Smynthurodes betae. Blackman & Eastop list 8 species of aphid as feeding on edible pistachio (Pistacia vera) worldwide, and provide formal identification keys. Of those aphid species, Baker (2015) lists 4 as occurring in Britain: Forda marginata. Geoica utricularia, Paracletus cimiciformis and Smynthurodes betae. In the USA Smynthurodes betae may cause serious injury to seedling cotton plants at times in the coastal plains of the Carolinas, and to squash in Utah. We are extremely grateful to Maria Fremlin who sent us living specimens of Smynthurodes betae from colonies she found on parsnip roots in allotments in Colchester, Essex. Maria also provided the image of live adult Smynthurodes betae on parsnip root, shown above.